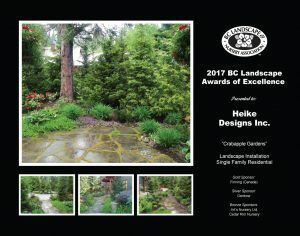 The BC Landscape Awards of Excellence recognize the year’s best in creating exceptional gardens. 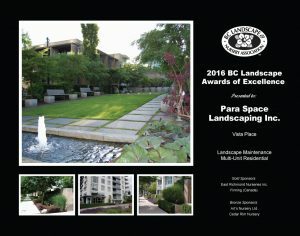 This prestigious annual competition honours the outstanding workmanship of B.C.’s landscape professionals in various project categories ranging from $5,000 to more than $120,000. 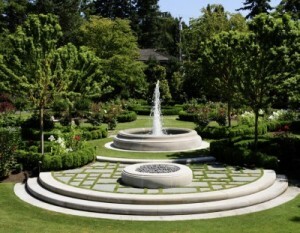 In late summer each year, landscape installation, maintenance and design firms submit their best projects of the season. 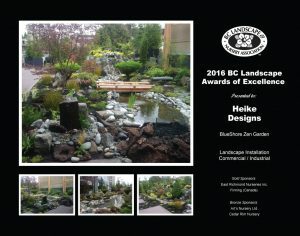 These projects are evaluated against rigorous criteria by seven highly accredited judges who are selected from various sectors of the horticulture industry including municipal or public gardens, nurseries, landscape companies, landscape architecture firms, educational institutions, garden communications, or garden centres. This 36th floor condo patio provides plenty of living space and amazing views. The challenge was to create a personal oasis in the city without obstructing the scenery. Thus use of stone pavers, crushed lava rock and basalt boulder helped bring a more natural feel to this semi formal design. 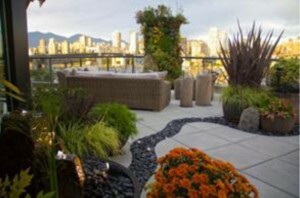 Careful placement of pots and select plantings help to soften this inner city hardscape. The idea behind this garden design was to create separate spaces to relax and enjoy the garden unified by the mix of natural and precast materials. Soft blues, tans & whites were used to generate a calming tone throughout. From the low seating walls to the verticality of the arbors, both combined to bring depth and scale to this small garden. Living for over a year in a sandy desert and concrete jungle, the owners decided to create a liveable space. 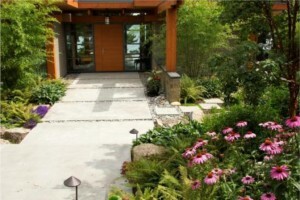 This project included a limestone patio, multiple water features, fire-pit, entrance stairs, and plantings. This is now an outdoor oasis. This is Landscape 2000 Ltd’s 6th win in 5 consecutive years. In 2012, they had two winning projects and one of those being the coveted Grand Winner which is only handed out in special circumstances. 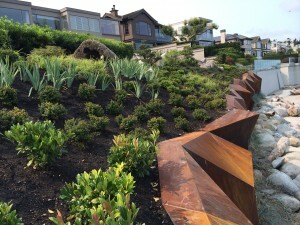 This unique metal sculptural retaining wall spans 200’ and varies in height from 6’-12’. Significant engineering and innovative construction methods were required to bring this functional artwork to life. Majority o the wall is free-standing with the remaining portion attached to an existing concrete wall. Working with the landscape architect and oceanic engineers significant foreshore work was undertake to dissipate wave energy and facilitate the deposition of sand to enhance the foreshort and create habitat for flora and fauna. The street side features layered planting surrounding the autocourt, imported stone paving for a brdge and steppers through the entry reflective pool and an extensive greenroof that transitions to natural grade as it approaches the street. 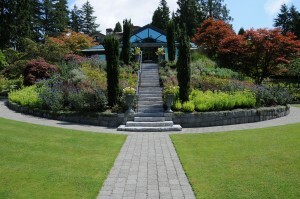 The ocean side included comprehensive foreshore work, a large planted retaining wall (20’high, 100’long), 35 screening trees, lower lawn and imported stone for entertainment terrace, slab stars and a curved seat wall. 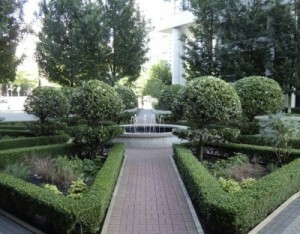 Extensive planting and feature trees were installed throughout the property along with a sophisticated irrigation system. 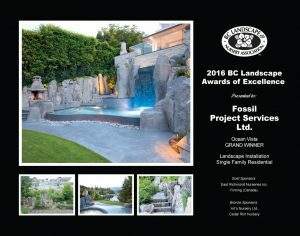 Fossil Project Services & Paul Sangha Landscape Architecture. This is the 3rd winning project in 2 consecutive years. They are also previous winners of this award in 2012 and with that project, they won the prestigious Nation Landscape Awards of Excellence. With construction blocking the scenic ocean view they once had, the challenge of this project was to disguise the new construction of the house next door and create a new sanctuary. 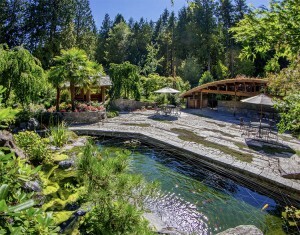 Now they have a stunning area with beautiful pergola, unique water feature and fire pit. 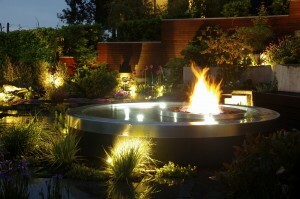 Every project that Landscape 2000 creates is like a piece of art. 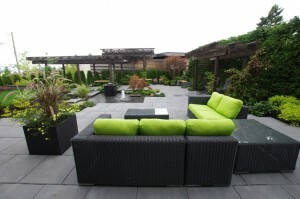 Our client was looking for an outdoor living space that incorporated as many natural materials as possible. 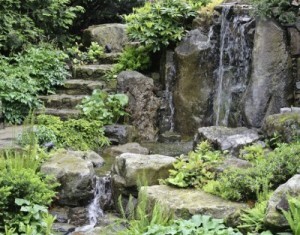 Stone slabs, stone risers, boulder retaining walls, and a natural style water feature. Materials were all local. The only element in the landscape that was man made was the hot tub. The artists that were hired, did do everything they could to make a concrete product look as natural as possible. We were all pleased with the final product. In the end the client was extremely happy with the workmanship and creativity that went into building his dream outdoor living space that he had requested. 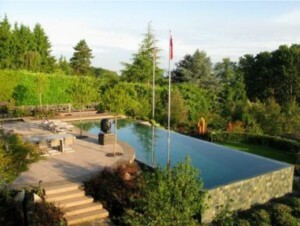 This 1.6 acre estate underwent a landscape overhaul that started in 2011 and with very specific goals in mind. Some of the earth friendly initiatives on the property include a 5,000 gallon storm water retention irrigation system, 5 beehives, 8 bumble bee colonies, the naturalization of a ravine, and the installation of a green retaining wall. The front yard features custom metal work, a greenroof over the garage, limestone and slate paving, and a water feature wall worthy of any Grand estate. 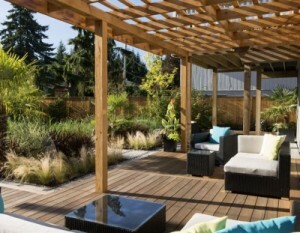 The backyard features a series of organic terraced vegetable plots, an extensive rose garden and a tennis court. The award winning Westminster Pier Park is built with equal parts built on land and water (supported by 3600 pilings) on previous industrial brown site. 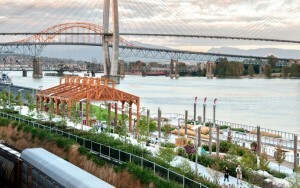 The park connects visitors to the Fraser River and when combined with the Waterfront Esplanade Boardwalk creates a 2.5 km linear waterfront park. Pier Park amenities include: a 600 meter water front boardwalk, festival lawn, concession, elevated viewpoints, gardens, benches, picnic tables, sand volleyball courts, a basketball court, public art and playgrounds. Westminster Pier Park has a number of public art features highlighting people, places and businesses significant to the history of New Westminster. A large oceanfront property landscaped to screen in and compliment a West Coast post and beam residence with large glass sections looking out to the water. Ancient granite left behind by underground streams was mined on site and used for step and wall construction. 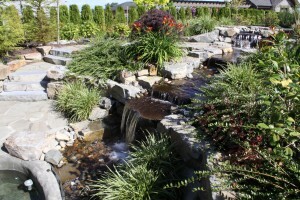 The stream bed itself provides natural drainage and was enhanced with iris ensata, sedum and nepeta for colour; ferns tie in with the natural forest surroundings; and black stem bamboo to give a light airy background. 6’ x 9’ precast concrete slabs were lifted into place by crane to bridge the creek and give formal entrance to the house. All plants had to be deer resistant to withstand the onslaught of a well-established herd that roams the area regularly. The clients’ impetus for renovating this garden was to create a space that was more usable, allowed for more movement for entertaining and was less maintenance. The original patio had been installed on a slope, was only large enough for a small table and that dining space was directly outside the patio doors. There also was a very small and unusable lawn space. The lawn was on the shady side of the garage and had a drainage problem. Patio, lawn and bamboo were removed. The new patio was made larger for entertaining and easy access to patio doors. A new garden was installed that included seasonal colour. Original pavers were reused. Unused wood products and plant pots were recycled. Soils were amended and plants were reused. The client now has much more functional space to entertain and enjoy. 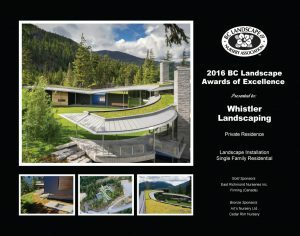 Caterpillar Award of Excellence for Residential Landscape Construction/Installation. 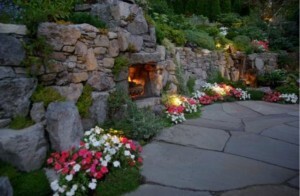 This project involved resculpting and transforming the back yard of an estate property in West Vancouver. The project started with an extensive excavation followed by the construction of 7' engineered architectural concrete walls, the installation of a vanishing edge swimming pool, a 3,000 sq ft dimensional cut basalt pool deck patio, a complete revamping of all garden and lawn areas, the construction of a custom cedar fence and pergola, the installation of a custom outdoor fireplace, 2 large firebowls, an outdoor audio system, and an outdoor "waterfall" shower. The house is on a small lot and had no privacy. The whole front entrance, stair, walkway, planting had to be removed and redone. 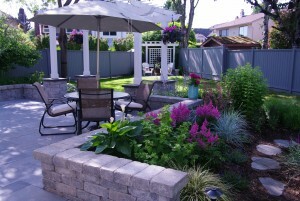 A little water feature was added as well as heavy planting for more privacy and a small patio. The backyard required some removal of overgrown trees. While rough grading the backyard big boulders were found. Instead of removing them a hole was drilled and used as a gurgler. We added a small pond and a little stream. 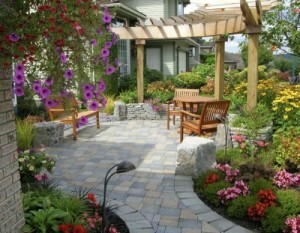 Bluestone was used for a patio as well as a walkway to the office. 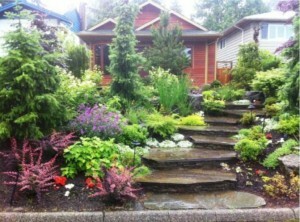 After a big house renovation the client needed some major landscaping done. Including redoing an existing and leaking water feature. 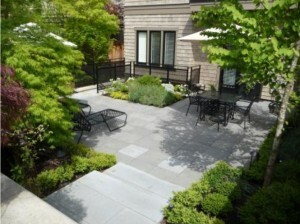 A nice bluestone patio was installed in front of the living room. To block the house to the south, as well as a safety feature, we built a pergola which is a nice shaded area on a sunny day, to enjoy the water feature. The backyard was a complete concrete jungle which had to be removed. Stairs, walls, BBQ and two water features, as well as a bluestone patio from which you can view the waterfalls. 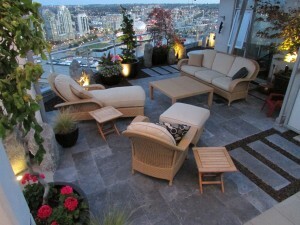 This is a 6th floor condo with a large patio and spectacular view of false creek and the city. The idea behind the design was to create separate areas for use yet maintain the scenery. Planted pots and a dry stream bed were used to divide the space along with cut ins to help lead you through the area and add interest. Water was also used in the form of a pot and small basalt gurglers to help mask out the sound of the city and create a calming atmosphere. The clients were extremely pleased with the final result.